A good number of review experts mentioned that the Asolo Shiraz GV was an excellent waterproof hiking boot. This boot impressed many wearers with regard to its comfort. Numerous owners were shocked to discover the A-grade traction of this footgear. Several users were able to break in their Shiraz GVs in no time. Based on a number of reports, this Asolo footwear has praiseworthy ankle support. Some owners commended the Shiraz GV’s breathability. The boot is satisfyingly light, according to a very few. Less than a handful of wearers deeply appreciated the footgear’s highly adjustable lacing system. A couple of consumers found the boot’s durability quite laudable. Some users criticized the Shiraz GV’s footbed for having insufficient cushioning. A very small number of reviewers were skeptical at best about the boot’s Cordura eyelets. Backpackers can look forward to what the Asolo Shiraz GV leather hiking boot has to offer. It has numerous fine qualities that speak for itself, although its excellent traction, outstanding level of comfort, and fantastic waterproofing are among the positives that accurately define it. And this is not without mention of its practically non-existent break-in period yet. That said, the boot’s footbed might be too scrawny for some. Overall, barring its unremarkable insole, the Asolo Shiraz GV is a kind of boot that the backpacking community should not ignore. I think they’ve produced a truly magnificent summer mountain boot, and my only suggestion to them would be to market the Shiraz as being for scrambling and rocky mountain terrain, rather than backpacking and long-distance hiking. All in all, an amazing boot. Make a list of what you look for in a pair backpacking boots – flexibility, breathability, durability, any other ability you can think of – and the Shiraz GV will tick them off one by one. The Shiraz GV’s upper is made of Schoeller K-Tech fabric with suede leather overlays. It is firmly tucked under Asolo’s Asoflex 00 MR lasting board. Its waterproofing is primarily handled by Gore-Tex’s Performance Comfort liner. Making every ground contact as safe and comfortable as possible is the boot’s dual-density midsole. The footgear’s Vibram Ascent outsole, on the other hand, is what lends backpackers traction on different types of terrain. 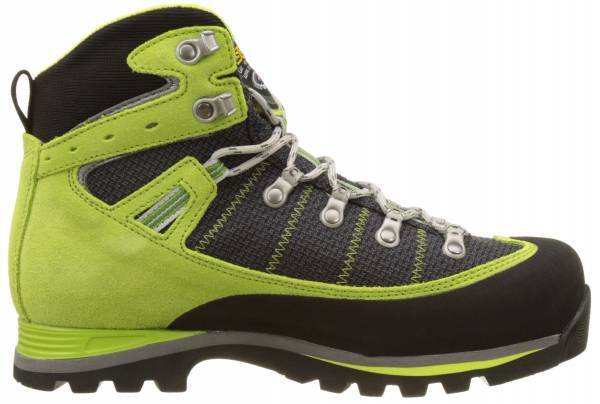 The Asolo Shiraz GV is a mid-cut backpacking boot for men and women. It runs fairly true to size. Its width is intended for medium-footed individuals. It is offered in a range of full and half sizes. The women’s version is built around a female-specific last. A personalized fit is achieved with the boot’s classic lace-up closure. On the traction front, the Asolo Shiraz GV comes with a rubber outsole called Vibram Ascent. The way its tire-like lugs are set up enables backpackers to tackle tricky slopes securely. The circular lugs taking up the outsole’s central space are designed to disperse water, reducing the likelihood of hydroplaning. In addition to surface grip, this component provides toe protection with its forefoot extension. Asolo gave the Shiraz GV a microporous midsole for ground contact comfort and stability. Its dual-density construction provides additional cushioning at key points, especially where the foot tends to roll. It comes engineered with an anti-shock insert (made of polyurethane) for extra impact mitigation. Upping the level of comfort provided by the boot’s midsole unit is the removable Lite 2 footbed. It is adequately perforated to prevent heat buildup. With the boot’s water-resistant Schoeller K-Tech upper complete with the Gore-Tex Performance Comfort liner, wearers are promised ample protection against abrasive hazards and water intrusion. Its overlays are made of suede leather at 1.8 mm thick. Its base is generously rubberized to bolster the upper’s defenses against abrasions. The boot’s tongue is also seamlessly bridged to the rest of the upper to wall off unwanted debris. The lockdown mechanism features round synthetic laces. Its eyelets are all metallic except for the synthetic lace loops located below the ankle line.